Honestly I actually loved this book so much. 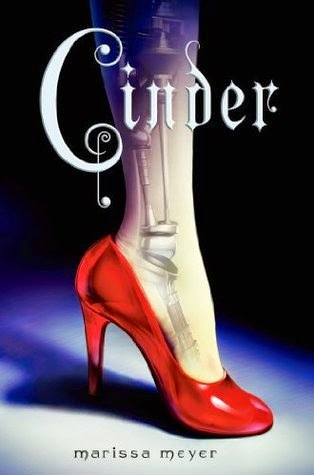 Marissa Meyer has done an amazing job of creating such a unique novel about cinderella with twist. I would catorgorise this book in the Sci-Fi / Fantasy genres, and thats perfect as those are both one of my favorite genres! First lets talk about the main characters. Cinder is such a cool character, also she is a cyborg which is totally AWESOME! Cinder is so funny! Her character's sarcasm is on point and half the things she says crack me up, she is definitaly the perfect type of character for this novel. Lets talk about Kai now, Kai is the prince of new beijing and he seeks Cinder to fix his android for him. When he goes to meet Cinder at her mechanic's booth theres a hint of flirtation there from Prince Kai which is so ADORABLE!!! Ok cmon when you read this book you will see that Kai is totally swoon worthy. ahhhh I love Kai. Ok guys last thing about the characters in this book. Iko. Iko is Cinders android thingy and oh my gosh she is so cute! She follows Cinder around and helps her with everything and and Iko also has a celebrity crush on Kai!!!! She is such a chatter box and is so adorable. Who knew a mechanical machine could be so loveable?? The book has been written so well and Marissa has Done such an amazing job on this book. This book is Cinderella with a twist and its been created so perfectly. The evil step mom and step sister are just like the ones in cinderella!, although the other sister Peony is friends with Cinder which works well because having Peony there shows how kind Cinder is! Sorry for the long review I write way to much! I definitaly recommend this book to all Young Adult lovers, It's worth the read and you won't regret it! I rated this book a 5/5 stars and I cannot wait to read the rest of the books in the Lunar Chronicles! If you would like to comment down below your favorite character from Cinder and Why!